In this construction article, detail guidelines are provided for the calculation of the formwork or shuttering quantity for column and beam. The calculation is based on the code of BIS - IS 1200:1982, Part 5- Method of Measurement of Building and Civil Engineering Works. 1. Compute the four sides of column at base or in cross-section. 2. Measure the circumference of column base. 3. Work out the height of the column. 4. To determine the shuttering area of the column, multiply the circumference of base and height of column. Alternatively, add all 4 sides and multiply it with height of column. 1. Select the cross-section of beam and calculate the lengths of the two sides and base of beam. 2. Sum the three measurements. 4. To find out the shuttering area of beam, multiply the span length with sum of the three measurements (beam base two vertical sides). The top side in cross-section of beam is not taken into consideration since it will be part of beam. Alternatively, add the beam height(2 sides) and beam base and multiply it with beam length. 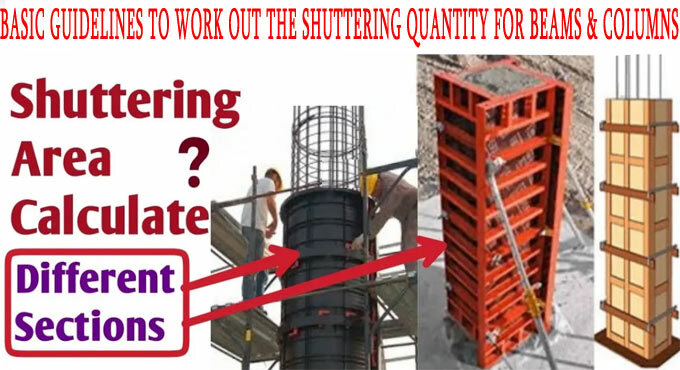 Given below, some other crucial factors necessary for selecting the shuttering quantities. • When it is necessary to align formwork with wall board, hardboard, polythene sheet, there should be no deduction for openings up to 0.4sqm. • There should be no deduction for any opening/cutouts when slip form technique is applied. • Raking or circular cutting and rounded or moulded edges should be calculated in running meters. Moulded stopping should be accounted. • Formwork to secondary beam should be calculated up to the sides of main beams, but no deduction should be created from the formwork of the main beams where the secondary beam bisects it. • Formwork to beam should be calculated up to sides of column, but no deduction should be created from the formwork to stanchion or column casings at junctures of beam. To learn the calculation, go through the following link.